Confessions of a summer parent - surviving the school holidays! When you think of summer you think trips to the beach, bbq's, days in the garden splashing in the paddling pool, oh and these 3 little words that send shivers down every spine.... School Summer Holidays! Its not so much that I don't enjoy having time with my little boy in fact I love getting to spend time with him and so does Evelyn and lets face it nobody likes getting up for the school run, so thats an added bonus of no school! However the difficulty comes when you have to try and entertain a child who has been used to being at school, occupied and with their friends all day. Whilst I always have these great ideas of what to do and days out planned its just not practical to expect to be able to fill each day with something thrilling. If not for anything else days out can be really expensive and there is only so many days out you can do in 6 weeks. Water play is a life saver for us in the holidays, its my go to cheat idea of something to do and its cheap! 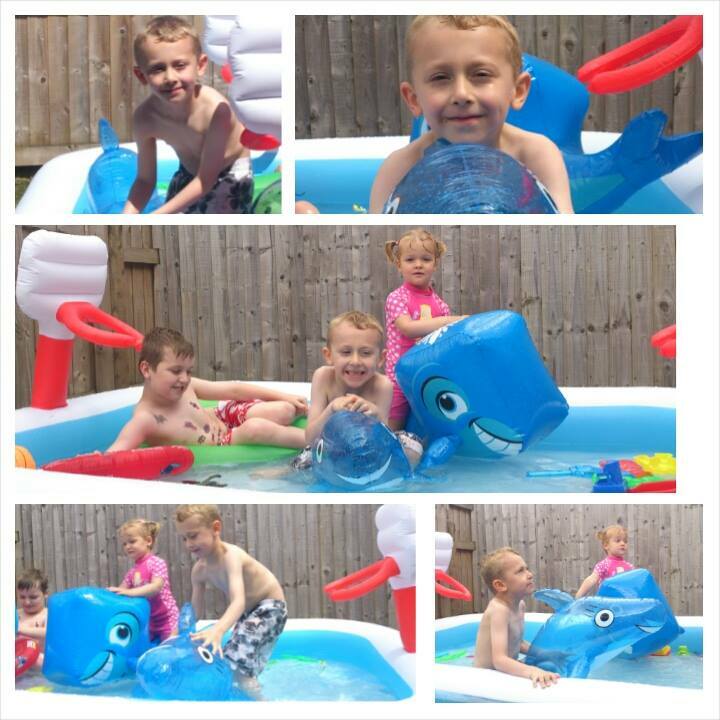 I set up loads of tubs of water, the hose pipe, the paddling pool and grab loads of £ shop water guns and toys and just let them run wild whilst mummy gets a bit of time to chill in the garden. I can even dip my feet in the paddling pool when it gets too hot and the plants and grass gets watered in the process! Its a total win win situation here. I also always try and plan some "play dates" with my sons school friends. Ok so it sounds mad as I will then not only have my won child but someone elses too but there is a method to my madness! When my son has his friends over he is quite happy playing and they tend to entertain themselves with a little help of some preplanned activities and maybe a new xbox game. Then we swap and James goes to his friends house and I can grab some peace and quiet!! I want to say I will get the cleaning done whilst he is at his friends but who I am kidding im most likely to stick my feet up and watch some cheesy soaps! Do you have any tips and tricks to get through the summer holidays? I would love to hear them! I think that organisation and having a plan - routine is important even if it is a bit more lax and lazy that in the school year. I used to love playing in the inflatable pool in our garden with my brother and sister during summer holidays as a child - such an excellent way to spend the day!